In 1969, Prince Spaghetti produced a TV commercial featuring twelve-year-old Anthony Martignetti racing home after his mother calls for him from the window of the family apartment in a three-story walkup in Boston’s North End. What the ad does not reveal is the simple fact that Anthony was born Antonio in Pozzuoli (Naples province), Campania, in 1957 and had immigrated in 1966—following the enactment of the Immigra­tion and Nationality Act of 1965—with his family to the United States. In hindsight, the young Martignetti’s undisclosed immigrant status can be understood as a cultural touchstone revealing the presence of a new wave of Italian immigration to the United States, one that would have significant impact in cities like Boston and elsewhere. The commercial, with its energetic young immigrant from Italy’s second mass migration, suggests discrepancies in the many narratives constructed and recounted about Italian migration and settlement in the United States. Again and again standard studies of Italian American history take as their starting point late-nineteenth-century immigration to the United States, and see immigration as concluding by 1924, the year of the Johnson–Reed Act, with a linear narrative of arrival—acclimation—assimilation from immigrant to third generation. Such neat accounts omit the phenomenon of Italian im­migration to the United States since 1945, or, when they do mention it, they do so in passing. 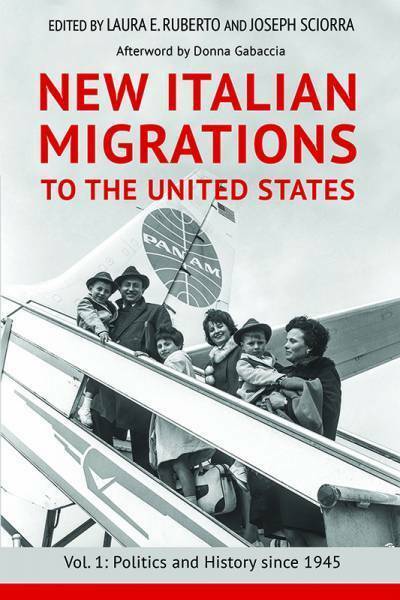 The book New Italian Migrations to the United States, Vol. 1: Politics and History since 1945(University of Illinois Press, 2017) proposes a radical rethinking of conventional historical periodization about Italian migration through a reevaluation of the political, social, and cultural significance of Italian emigration to the United States in the second half of the twentieth century and up to present day. This interdisciplinary work brings together an elite roster of scholars in Italian American studies to examine the ways Italian Americans mobilized against immigration restrictions, the politics of the 1952 McCarran-Walter Act and its effects on women, the transnational workings of ethnic political brokers in Queens, second-generation Guido youth culture, and the transformation of identity in Boston’s North End. The second volume in this series, New Italian Migrations to the United States, Vol. 2: Art and Culture since 1945, also coedited by Ruberto and Sciorra is due out with the University of Illinois Press in fall 2017. On Monday, September 18th, coeditors Laura E. Ruberto and Joseph Sciorra will present the book, along with contributors James S. Pasto and Donald Tricarico, at the John D. Calandra Italian American Studies at 25 West 43rd Street. Nota Bene: This blog post was liberally borrowed from Laura E. Ruberto and Joseph Sciorra's "Introduction: Real Italians, New Immigrants," New Italian Migrations to the United States: Volume 1, Politics and History since 1945, University of Illinois Press, 2017, pp. 1-33.